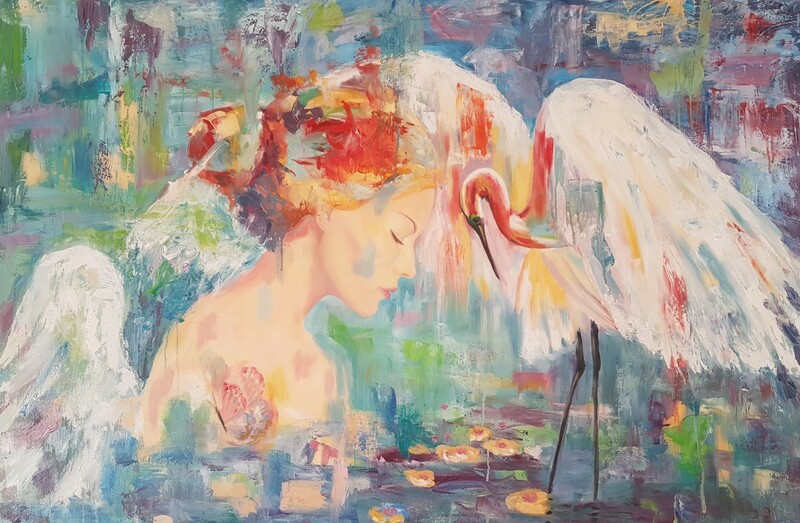 Ramona Pintea is an established Surrey based artist, who works primarily in oils, with occasional forays into acrylics and mixed media. Her paintings provide colour and character in private collections stretching from Norway to Canada, England to Latvia, and Honk Kong to the Philippines. Ramona’s work is a fluid fusion between abstract and figurative with one overriding purpose, the quest of self-discovery. It’s a chromatic journey towards answers, an energetic existential debate. Our life is a continuous search whether consciously or not, we try to find meaning to discover who we are, what our life’s purpose is and how we can be happy. The paintings aim to catch the moments of vulnerability along this journey, to reveal a desire to communicate with other celestial dimensions and the experience is sometimes tumultuous, other times serene. Her art aims to connect us to a different dimension, charming and fulfilling, but equally real and available. She warmly invites you to explore and celebrate the overlooked universe of our inner grace, of magic moments on our life journey, of deep and meaningful love, of majestic and everlasting natural beauty. The artist pays great reverence to the figure as it’s endlessly symbolic and emblematic of the exposed, tender state. She uses colour with intent, inspired by the chakra color system and teachings from spiritual guides. Her work seeks to give neither strict symbolic meaning, answers to any questions, nor to delineate on existing narratives. Instead the artist invites you to explore a universe of connection with the meaningful and perennial. Because life, humanity and beauty deserve to be celebrated.